Bharti Airtel, the India's leading telecom services provider, has recently launched 'Airtel Self care' – an online account management facility for its customers. Airtel Self Care is an unique online service that includes managing your account online, paying bills and also provides access to a lot of other services which usually is not possible for the customers before. For example you can manage yourself the billing service referred as activating/deactivating paper bills without need of any customer care executive's help. Now, Airtel customers can enjoy the benefits by quickly paying their online bills for mobile phone, fixed line, broadband and digital TV services.It accepts all major credit/debit cards to make online payments. Step 1: Click on “Register” link at the self care site.It will retrieve the online registration form. Step 2: Within Few seconds after registration you will receive your password via SMS. 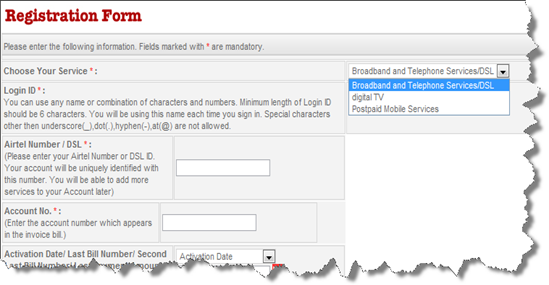 Step 3: Enter your username and password to login to the service. Step 1: Click on “Payment” link in the welcome page. It will redirect to the payment history page which also shows last bill payments information. Step 2: Click on “New Payment”, which will retrieve the your bill amount information and payment options. Step 3: Select your payment option and you will be directed to a payment gateway, where you will have to enter your credit/debit card details. Step 4: You will receive a transaction acknowledgement after the payment is successful. Other than accepting your regular Visa/Master Cards, it also accepts Dinner and American Express cards.